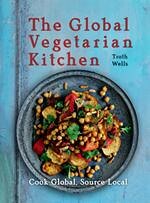 The Global Vegetarian Kitchen features outstanding full-colour photographs, which accompany more than 100 easy, appetizing recipes for vegetarians, vegans and those who just enjoy good food. Whether you grow your own food, source fair trade or buy local, this cookbook starts where you are, offering tips to source local and cook global. Let us know how your version of this recipe turns out by posting a comment below! There are many ways to make this Latin American dish with some variation on the ingredients below. It has a lovely complex flavor and the mix also makes a great filling for burritos (Global Vegetarian Cookbook, p 76) or empanadas (p 88). Achiote oil uses annatto (bixa) seeds which give color and flavor. You could use ordinary oil instead and add ½ tsp of turmeric. 1 Heat the oil in a large pan. Put in the onions and cook until soft. Then add the bell peppers, garlic and cayenne, plus the turmeric if using. Fry gently for a few minutes to soften the peppers. 2 Next, add the beans, tomatoes, sultanas or raisins, capers, cumin, oregano and thyme. Season, and stir. 3 Reduce the heat now and leave to simmer for 10-15 minutes to deepen the flavors. Now put in the olives and simmer for a few more minutes to warm them through. Serve with potatoes or rice. * To make achiote oil, heat ½ cup/50 g annatto seeds in 1 cup/240 ml vegetable oil. Boil until oil is deep bright orange. Strain seeds from oil. 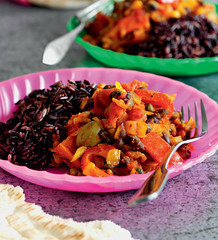 Instead of this you can use ordinary vegetable oil and add ½ tsp turmeric, to give the color.